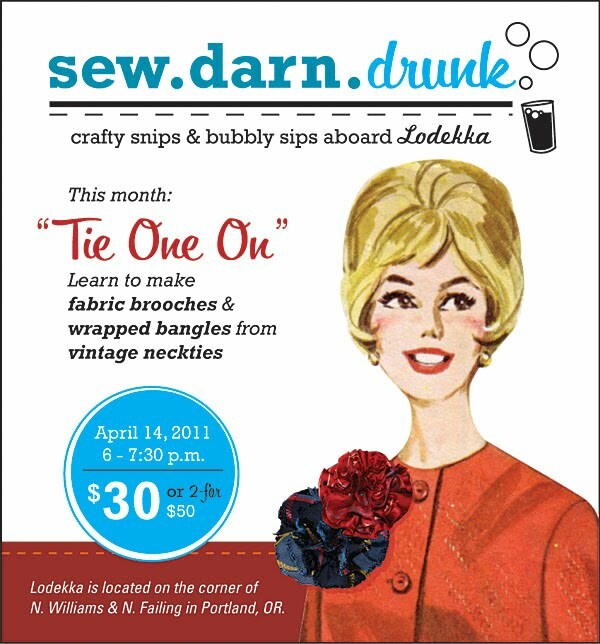 It's time to get "Sew.Darn.Drunk."! Lodekka Double Decker Dress Shop is partnering up with Andrea "CraftyBitch" DeHart to present Sew.Darn.Drunk., a monthly craft workshop with a twist. Each project will utilize vintage threads and notions to craft one-of-a-kind projects including accessories, home decor and wearable fashions. On Thursday, April 14th, we're going to "Tie One On." Learn how to convert a vintage necktie into a fashionable fabric flower accessory in addition to a fabric-wrapped bangle. No sewing or crafting experience necessary! It's easy, fun, and all supplies will be included. All materials, instruction and a complimentary beverage will be included with the price of admission. $30 fee per person or bring a friend and get 2-for-$50. Enjoy a 25% discount at Lodekka and raffle prizes that evening. Seating is limited to stop by the bus or call Erin at 503-703-3605 to reserve your seat today. Lodekka is located on the corner of N. Williams and N. Failing in Portland, OR.